FASTER is an interesting project, with some unique approaches to solving their tasks that I haven’t encountered before. When I initially read the paper about a year or so ago, I was impressed with what they were doing, even I didn’t quite grasp exactly what was going on. After reading the code, this is now much clearer. I don’t remember where I read it, but I remember reading a Googler talking about the difference between Microsoft and Google with regards to publishing technical papers. Google would only publish something after it has been in production for a while (and probably ready to sunset ) while Microsoft would publish papers about software that hasn’t been deployed yet. The reason I mention this is that FASTER isn’t suitable for production. Not by a long shot. I’m talking about issues such as swallowing errors, writing to the console as an error handling approach, calling sleep(), lack of logging / tracing / visibility into what is going on in the system. In short, FASTER looks like it was produced to support the paper. It is proof of concept / research code, not something that can take and use. You can see it clearly in the way that the system is designed to be operated. You have dedicated threads that process requests as fast as they possibly can. However, there is no concept of working in any kind of operational environment, you can’t start using FASTER from an ASP.Net MVC app, for example. They models are just too different. I can think of a few ways to build a server using the FASTER model, but they are all pretty awkward and very specialized. This lead to the next issue with the project, it is highly specialized solution. It isn’t meant for general consumption. In fact, as I can figure out, this is perfect if you have a relatively small working set that you do a lot of operations on. The examples I have seen given are related to tracking ads, which is a great example. If you want to store impressions on an ad, the active ads are going to pretty small, but you are going to have a lot of impressions on them. For other stuff, I don’t see a lot of usage scenarios. 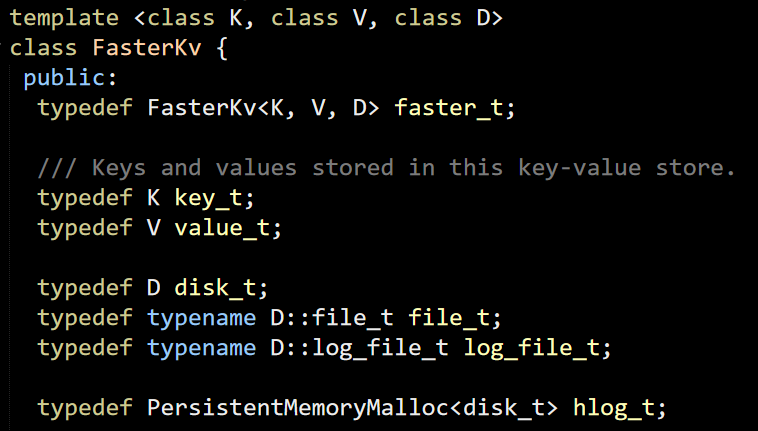 The API is awkward to use, and you need to write a bit of (non trivial) code for each key/val you want to store. Now that I have gone over the code, I’m not quite sure what was the point there, to be honest. In terms of performance, you can get about 25% of the achieved performance by just using ConcurrentDictionary in .NET, I’m pretty sure that you can do better by literally just using a concurrent hash map in C++. This isn’t something that you can use as a primary data store, after all, so I wonder why not just keep all the data in memory and be done with it. I liked the mutable / read only portions of the log, that is certainly a really nice way to do it, and I’m sure that the epoch idea simplified things during the implementation with the ability to not worry about concurrent accesses. However, the code is complex and I’m pretty sure that it is not going to be fun to debug / work with in real world scenarios. To sum it up, interesting codebase and approaches, but I would caution from using it for real. The perf numbers are to salivate over, but the manner in which the benchmark was written means that it is not really applicable for any real world scenario. So far, I ignored anything in FASTER about how the data actually hits the disk. Based on my reading of the code and the paper, here is what I think that is going on. FASTER works in segments and in conjunction with its allocator. When you create a new instance, you have to define what would be the log size. From looking at the code, they seem to be favoring 16GB as the default size of the log. This is passed to PersistentMemoryMalloc, which uses pages of 32MB each to manage the memory. Out of these 16GB, 14.4GB are considered to be mutable and 1.6 GB is considered to be read only. Again we have num_slots that actually means size in bytes, but I’ll leave my pet peeves aside. You can see that this allocates from tail of the page use Reserve, which does an atomic operation. 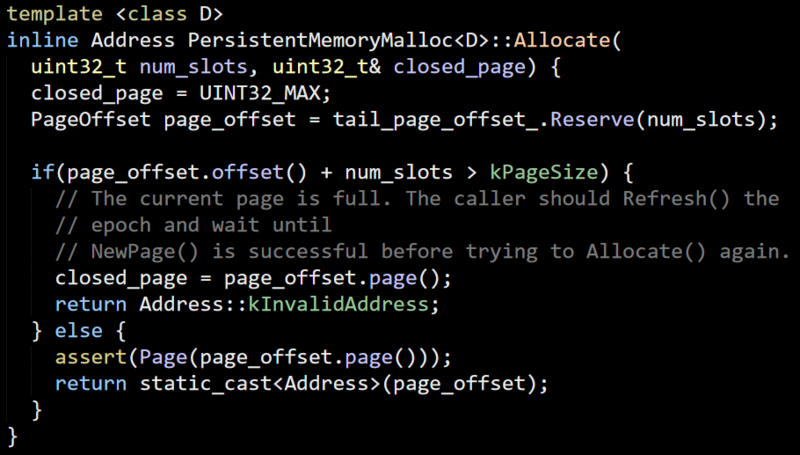 If we run out of space in the 32MB page, the caller need to call NewPage() to handle the new allocation. This plays together with the buffer management and the epoch. In particular, here is how a new page is allocated in the normal case. Assuming we just started and we consumed 64MB of memory, the new entry will allocate the 3rd page. This will also move the section of read only memory when there is a new page allocated and the number of active pages is beyond 14.4 GB. What this means, in practice, is that FASTER typically has a 14.4GB range in which all operations are working on purely mutable memory. That means that two impressions on the same ad will end up being very close to simply Interlocked.Increment on the relevant value. This is the key for the performance that FASTER exhibits. What happens once we start going beyond the 14.4 GB? FASTER will begin to move data to the read only section. In this case, it means that the any new modifications to the data will create a new copy of it in the mutable section. The notion of read_only_address and safe_readonly_only_address is discussed in the paper quite nicely, by the way. AsyncFlushPages() writes the data to disk, as you would expect and updates various in memory structures. What you can see is that the destination offset is used to divide the data on disk to sections. Each section is 1GB in size. In other words, the way FASTER works is to write the data in 1 GB segments that are sequential over time. This also plays into the expiration policy that FASTER employs. Because it uses a logs based system, it accumulate data over time and will need to handle that. The current way it deals with the problem is to just delete old files, this gets rid of the data in roughly time based order, which is suitable for the use case that the paper talks about. Another alternative is to read the old files, and move the still valid entries to the start. That doesn’t seem to be implemented and I think it will be pretty hard to do and likely consume a lot of resources. 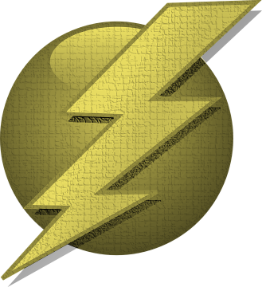 I’ll probably have another summary post about FASTER, but that is pretty much it. I’ve ignored other parts (recovery, several state machines used to handle internal state, etc), but they aren’t important to grokking what it is actually doing. 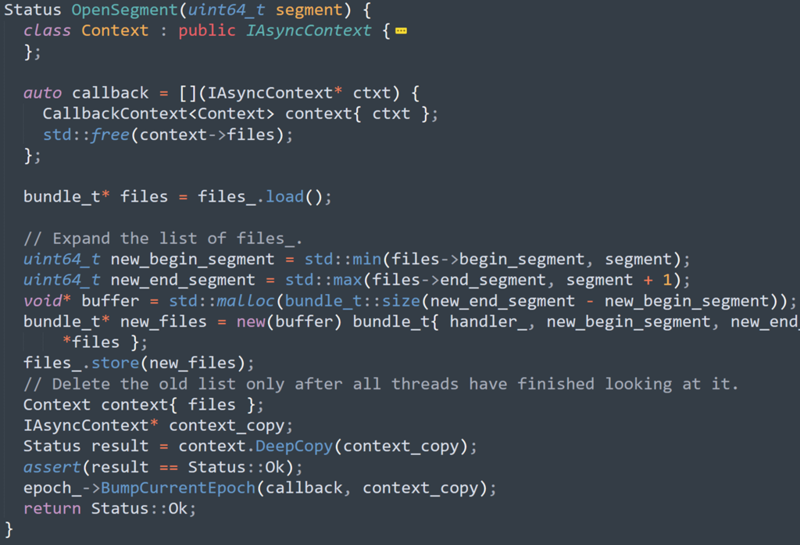 It is an interesting codebase, but it feels… incomplete. But I’ll reserve such thoughts to the summary post. One of the things that FASTER claims is that it is suitable for larger than memory datasets with its hybrid log approach. I briefly went over that code during my review, but I want to dedicate this post to discussing how FASTER work with the disk. FASTER is using async I/O on Linux & Windows to do its I/O, which present its own challenges, in particular, how do you handle an operation that is going to need to hit the disk ( to read old data). Another thing that I would like to discover is how does it save the data to disk. We’ll start from the reading data part. You pass a context, a callback and serial number. I’m not sure what the serial is about, I think it is about checkpoints, but not sure. You’ll be called with the results once the operation executed. FASTER first checks the in memory details, and if it isn’t there it is either not found or on disk. This is actually really interesting, because it implies that FASTER keep track of all of the data items purely in memory. Let’s go to InternalRead and figure out how that works. We already looked into most of that in the previous post FindEntry is called to find the entry by it’s hash. FASTER keep all the hashes in memory, even while it is writing entries to disk. This way, it can easily answer if an entry exists or not. Note that as I read things, if FASTER has more than a certain number of values, hash collision rate is going to reach high percentage, requiring often expensive I/O to figure out whatever the value exists. The go_async() method just records the status of the operation when we started the async process, it doesn’t actually invoke anything async. That is done in the caller code, Read(). Note that the code is full of handling of the current phase of the thread. I’m ignoring all of these for now, they aren’t important. We first register the pending I/O, then actually starts to process the async call. Except that not really. AsyncGetFromDisk() isn’t actually doing I/O. Instead, it seems to be focused on limiting the number of concurrent I/O operations that are going on. In this case, if there are more than 120 pending I/Os, it will call io_getevents() in Linux and GetQueuedCompletionStatus() and try to process any completed I/O immediately. ProtectAndDrain is more interesting. It asks the epoch to complete any pending operations. Such actions are the creation of a new segment file or the moving of a segment from memory to disk. That was confusing, I expected this to be the number of records (as in, how many records are read from disk) but this is the number of bytes to read. 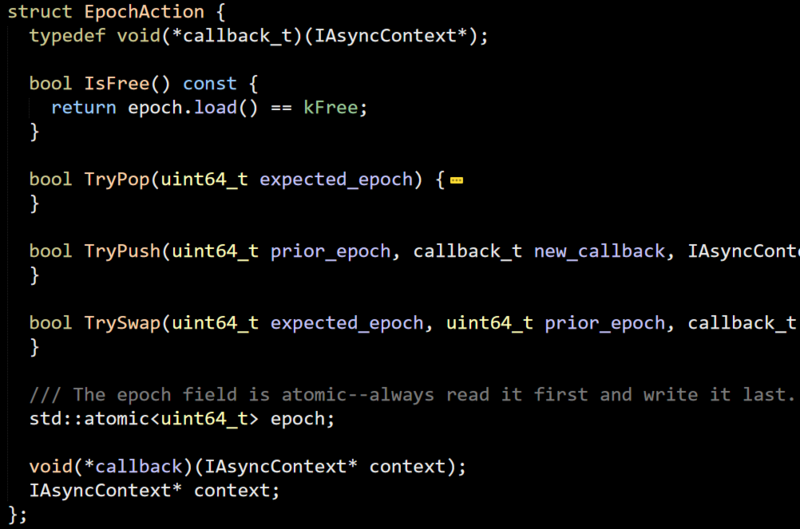 The C++ memory model make async code a bit complex. 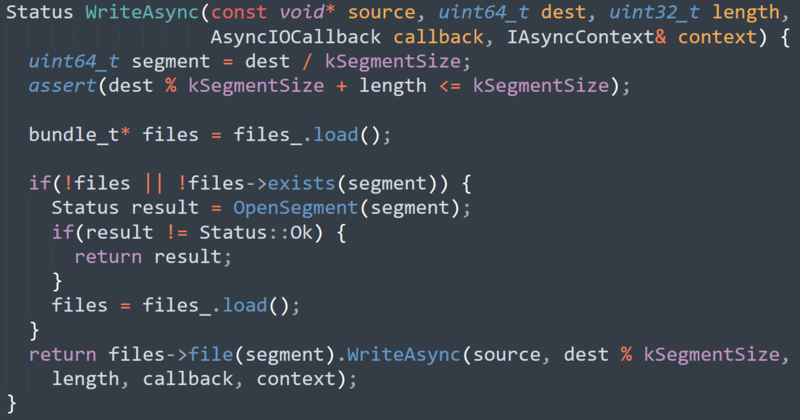 In particular, if you’ll look at the first code snippet in this post, you’ll see that we pass a stack allocated struct to the Read() method. Because this method can complete in an async manner, what FASTER will do is to perform a deep copy of the data. Combine that with lambda’s capturing state, and I’m pretty sure that this code will cause a very subtle memory corruption in rare cases. What I think will happen is that we capture by ref the stack variable and in 99% of the cases, we’ll run this in sync mode, meaning that there will be no issues. Only if the value needs to be read from disk will you get an issue. 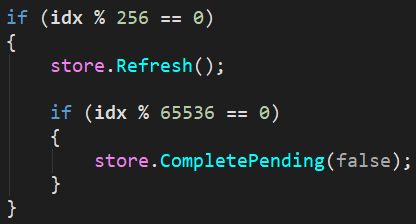 Because that function will already return but you still have the callback (and the captured reference now pointing to something completely different) still active. 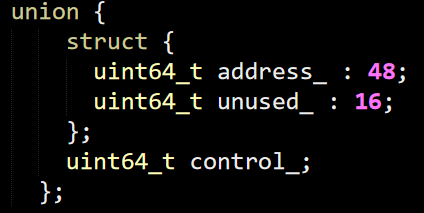 I think that a C++ developer would recognize this, and the fact that C++ require you to be explicit about your captures make this a lot easier to deal with. 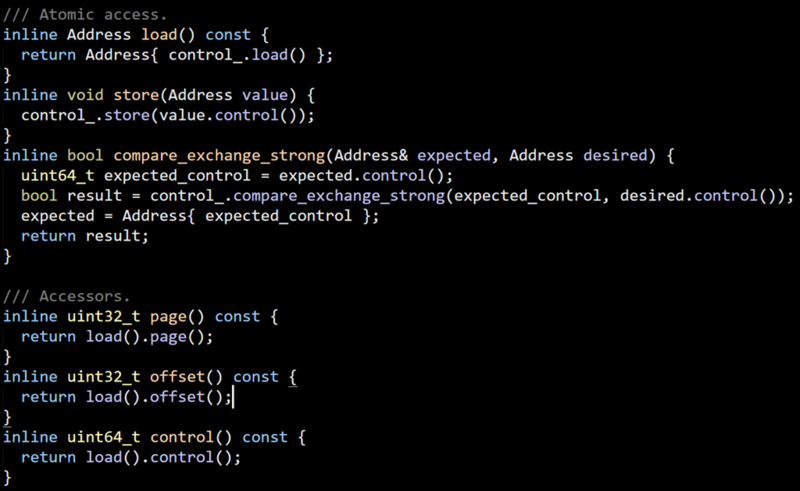 It is important to note that there is no good way to actually handle the async nature of certain operations here. Any code that actually handle the operation need to go in the callback. In other words, if you have a way to generate hash collisions, as soon as the value hits the disk, you are going to be facing with making N disk I/O requests to find if you have the value or not. Denial of service attacks against hash tables are well known and represent a significant risk of to services. Next on my list if seeing how FASTER is actually writing the data to disk, but that will be in a separate post. 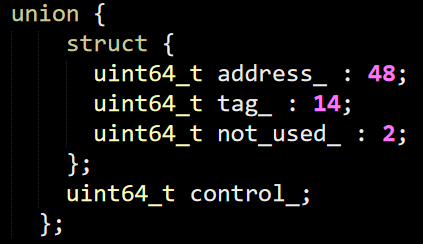 This starts to get interesting for me, so let’s dig deeper into HashBucketEntry, where they use the same union trick I talked about in my previous posts, this allow to easily define an atomic version of it with very little effort. I got to say, I’m really liking this approach for handling data packing as well as multi threading concerns. It also plays very well with the actual cache line architecture of modern CPUs. This simply index into the buckets_ array by taking the (size_ –1) bits from the hash itself. That tells me that the FASTER structure is very sensitive to the choice of hash function that will be used. This SO answer has some amazing detail on analysis of the output of hash functions with different outputs, which can give you some idea about why this matters so much. This post is an in depth discussion of this, as well of why the choice of hash function matters. This is enough for me to stop everything and try to find what kind of hash function is actually being used here. A bit of searching on the interweb didn’t narrow it down to something specific, it may be something that they wrote specifically for that. Given that the paper doesn’t mention this, it doesn’t seem to be something special. Given that 40343 is a prime, it seems like a pretty common pattern of multiple by a prime with each 16 bits portion of the key. The idea is that the multiplication by prime will spread the bits around. No idea how high the quality of this hash function is, since actual analysis would take at least a few hours. At least at a glance, it doesn’t seem to be awful, but I do wonder whatever something like FNV-1. In fact, this is very similar, but with different prime and offset and with addition instead of XOR. You can see that there are a bunch of stuff going on here. 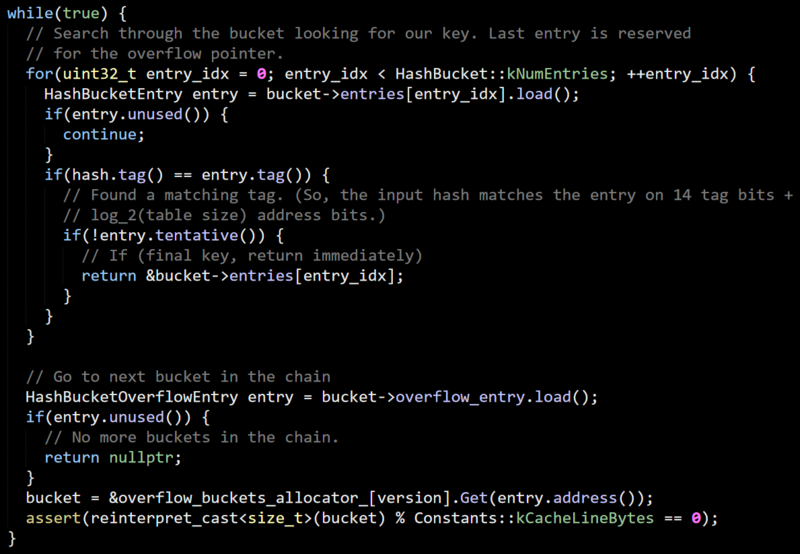 First, we run over the known entries in the bucket, trying to find an entry with the same tag. You can see the tentative usage, which is used to sync up between concurrent readers and writers. There may be more items in the bucket than we have space for, so there is also the concept of overflow. 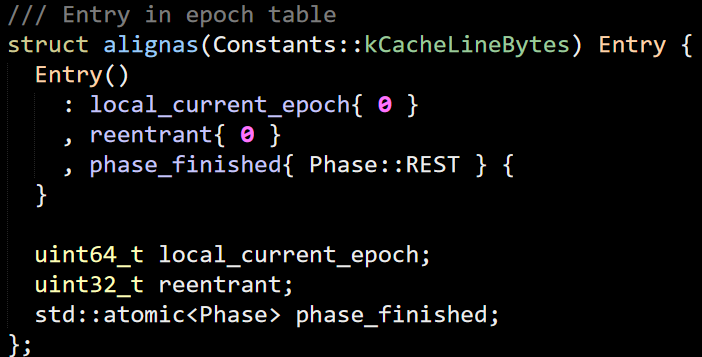 This is basically a linked list of 7 items at a time and likely to be pretty fast (frequently already in the higher tiers of the cache for commonly accessed data). This is the first time that we actually run into the hybrid log (hlog here). But the basic idea is pretty obvious. Either the key match, or we have a pointer to the previous entry. I’m not seeing any handling of complete mismatch, though. 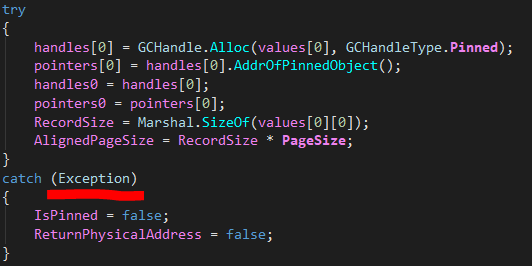 I’m pretty sure that this is a bug (the behavior is different in the C# version). 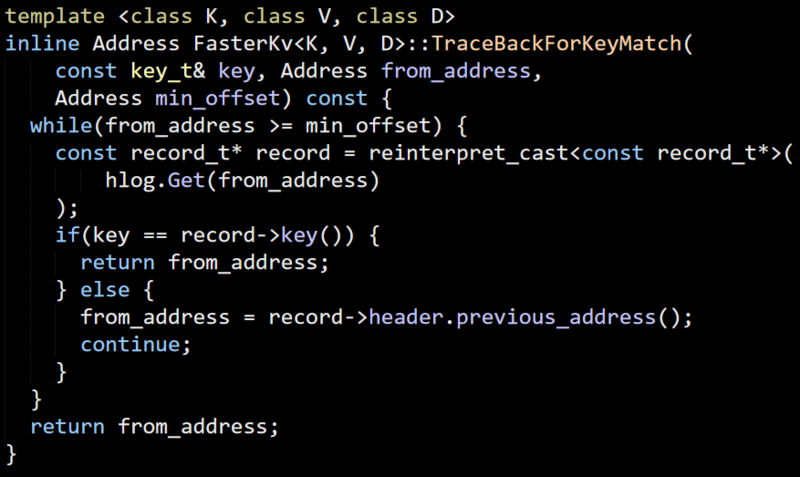 This is enough for now, from here the InternalRead code is starting to do things with the hlog, state machine, etc. I’m going to handle that in a separate post.